Maltese women had been enjoying equal pay for decades, but the widening gender pay gap has caught up with the island, President Marie Louise Coleiro warned. Legislation alone was not enough, and achieving full gender equality required political will, she said on Wednesday. 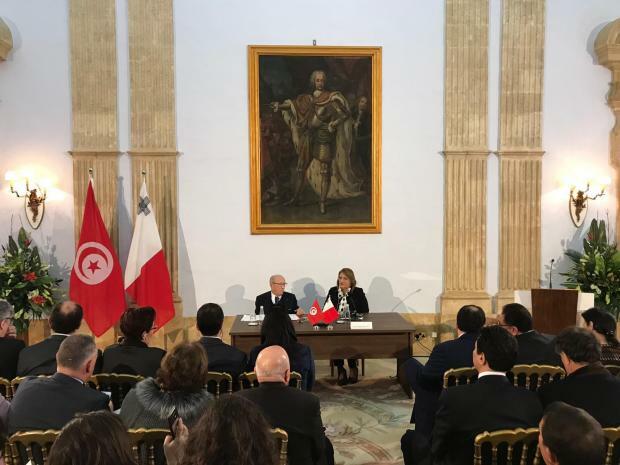 "These disparities are a new form of the same old discrimination and inequalities," President Coleiro Preca said at a conference called Empowering Gender Equality on the occasion of the state visit by Tunisian President Beji Caid Essebsi. Nearly half of local council positions in Tunisia are held by women, and the North African country has also become the first Arab nation to approve gender equality in inheritance law. In light of rapid changes in the Mediterranean, President Coleiro Preca said "we must be brave" and implement our vision for the future of women and their empowerment. "We are living at a time when we must respond to the complex phenomena facing our families and communities within our region. Unfortunately, these phenomena include conflict, poor working conditions, environmental degradation, and increasing flows of migrants seeking hope and safety." Noting that increasing the social and political visibility of women was essential, she commended her Tunisian counterpart Mr Essebsi for the "impressive achievement" of 47 per cent of the local council positions in Tunisia being held by women. She referred to Mr Essebsi as a "stalwart of equality" who had also set up the Individual Freedoms and Equality Committee to propose reforms for the Tunisian legislative system. Ms Coleiro Preca meanwhile referred to improvements in Malta, including the 16 per cent increase in female participation within the workforce and gender parity in the Judiciary. However, there were still disparities reflected in a widening gender pay gap, she said. Although Maltese women have enjoyed equal pay for decades, this phenomenon, present throughout the Euro-Mediterranean Region, had caught up with us too, she noted. The President insisted that one could not afford to ignore such inequalities and injustices. Women played a vital role in a country’s socioeconomic growth - when women’s contributions were undervalued, the whole socioeconomic life of the country suffered, she said. In this context, Ms Coleiro Preca referred to a "very telling indicator" from the Organisation for Economic Co-operation and Development, which showed that gender equality in the economic sector could increase the GDP of the Mediterranean Region by more than 25 per cent. Gender-based challenges such as violence against women could not be allowed to continue preventing us from reaching our full democratic goals, she added, noting that according to the Euro-Mediterranean Women’s Foundation, femicide was a “silent scourge” in the Mediterranean. Both Malta and Tunisia had the proper legislation in place to combat violence against women, however, it was essential to take these strategies further. "We cannot sit on our laurels. We need to endeavour further. "It is time to address the underlying mentality and stereotyping, which are constraining many girls and women, and excluding them from active participation in economic, social, and political life." The conference is being co-facilitated by the Mediterranean Academy of Diplomatic Studies at the University of Malta, the Embassy of the Republic of Tunisia, and the Office of the President of Malta. Despite the different electoral systems, Malta’s 14 per cent female representation in parliament pales against Tunisia’s 47 per cent in local councils. Pro-Rector Carmen Sammut, who sits on a committee exploring legal and technical aspects ahead of a public consultation on improving female participation in Malta’s democracy said Parliament should act as a model for the rest of society. Unless we “shook the tree”, Malta will not manage to reach the UN goal of 50 per cent male and 50 per cent female representation by 2030, she said. However, she pointed out that while Maltese female candidates have been running on the spot for decades, they broke the ceiling when it comes to MEP elections. Prof. Sammut noted that women had to achieve what is known as the ‘critical mass’ of 33 per cent representation in order for them to start being elected on their own steam.